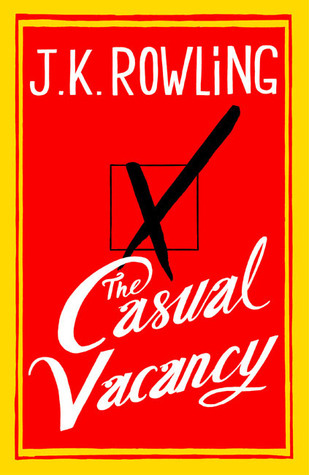 Like with the Harry Potter series, I read The Casual Vacancy over the course of a few days. That’s where the similarities end. And that’s fine with me. I didn’t pick up the first adult book written by J.K. Rowling and expect it to be anything like her kids’ books. What I hoped for was a riveting read – and I got that in spades. Set in the picturesque English village of Pagford, The Casual Vacancy follows the lives of various villagers: from self-important council members to dissatisfied housewives, troubled teens, and a teen girl from the local housing estate who for me is the heart and soul of this story. It is not a spoiler to tell you that the story begins with a death. We know Barry Fairbrother for exactly two and a bit pages and then he dies. His death leaves a ‘casual vacancy’ on the Parish Council – an entity made up of two warring factions. The plot revolves around the filling of this seat and the impact of the sudden death of a man on the lives of many. I purposely steered clear of reviews and commentary before reading this book as I wanted to be surprised. I was surprised. The publishers have marketed this as a ‘black comedy’, but I can’t say I laughed. Instead, I admired the characters Rowling has created. We all know people like the ones in this book. Most of them aren’t very likeable but that didn’t stop me admiring the way Rowling constructed them. The point-of-views of the various teenagers in this plot were spot on – from the teen pining after his ideal girl and despising his father; to another who doesn’t care who he hurts in his quest to be ‘authentic’; to a teenage girl who is the victim of a bully; and another teenage girl who is old beyond her years having to deal with a mother on and off drugs. At first it is a little hard to keep up with all the different characters and sort out their various connections to each other, but then after a while it all slots into place. Some book critics have panned The Casual Vacancy for being an ‘attack on the middle-class’. Others have called it ‘bleak’. Yes, it is bleak – but that didn’t stop me from enjoying this story. My advice is to read this book and make up your own mind. For me, this book with its troublesome characters and dark themes was a worthwhile read. I can’t wait to read what Rowling writes next. Have you read The Casual Vacancy? What did you think? Previous Article The new J.K. Rowling book – what are your plans? Im probably putting the book off, unless I have the sudden urge to try something new. I think you can’t compare two completely different genres. It has to be judged on its own. Come back when you’ve finished reading and let me know what you think. I’m planning on reading this soon. I’m glad to hear a positive review. I think people are panning it unfairly because it’s not Harry Potter, but I suppose time will tell! Definitely. I think you just need to read it as a stand-alone book and give it a chance. I agree – it was worth reading. I too am a fan of Harry Potter and had looked forward to Rowling’s first venture into adult lit. The book was a downer though – the world goes on – without magic.